Major focus of this report is to discuss and analysis international Trade Imbalance between Bangladesh and India. Currently India will be the 2nd largest trading partner of Bangladesh and India’s position is at the pinnacle for Bangladesh’s imports industry. So the study underscores the actual trend, structure and recent picture of Bangladesh-India Trade Imbalance. From this report find out some idea how can minimize various problem related trade imbalance. India is by far the largest single source for Bangladesh’s imports (15% of total in FY05), ahead of China and Singapore. Bangladesh’s perennial large bilateral trade deficit with India might be a cause for concern but it has not led to any balance of payments problem for Bangladesh as consistent trade surpluses with such trading partners as US and EU compensate for these deficits. Movements in bilateral real effective exchange rates (REER) could significantly impact trade flows. There is strong evidence that appreciation of bilateral Taka/Indian Rupee REER contributed to the expansion of both formal and informal Indian exports to Bangladesh, while retarding the growth of Bangladesh exports to India, during most of the 1990s. Indian exports face import weighted Bangladesh tariffs of about 29%, suggesting that they compete favourably with imports from the rest of the world. Though protection remains high with para-tariffs being imposed on top of custom duties, India is able to export a wide range of products to Bangladesh covering all but 4 of the 98 HS chapters. Bangladesh granted few – mostly symbolic — tariff concessions to India under SAPTA. India’s specific tariffs on Bangladesh’s major exports (RMG) make it difficult for such exports to penetrate the Indian market. Though industrial tariffs in India are now mostly at 15%, most Bangladesh exports face 7.5% tariffs under SAPTA. Yet exports are negligible suggesting they face stiff competition from domestic production and ROW exports. Bangladesh exports a miniscule (<1%) share of India’s imports, a negligible share (1%) of its own exports, and a small range of products (fertilizer and jute goods made up two-thirds of exports). Bangladesh exports might have been restrained by (a) faster productivity growth in India bolstering its comparative advantage in competing goods, and/or (b) tariff and non-tariff barriers constraining Bangladesh’s major exports (RMG) or minor exports, which have experienced rapid growth elsewhere. India uses WTO-compliant measures – e.g. anti-dumping, standards – for “contingent” protection which could pose as non-tariff barriers to imports from Bangladesh. The large volume of informal/illegal trade remains a problem magnified by poor logistics and infrastructure at land border posts that prompts higher transaction costs for formal imports. Cross-border and technical smuggling are further encouraged when both India and Bangladesh restrict imports over land border via designated ports. Informal trade is substantial but difficult to measure because of its clandestine nature. Informal and illegal trade between India and Bangladesh, by some estimates, could be as high as three quarters of recorded trade. It is mostly one way — from India to Bangladesh. Quite apart from the well-known cross-border informal trade, this study notes the existence of significant volumes of illegal imports into Bangladesh through legal channels (technical smuggling) by under-invoicing, misclassification, and bribery of customs. The study finds that preferences for formal trade will be influenced by the levels of Bangladesh protective tariffs, rigor of customs administration, and the state of infrastructure at border posts (roads, storage, technical and administrative capabilities). To reduce informal/illegal imports, both countries need to (a) improve infrastructure – physical and administrative – at land border customs posts; (b) streamline and harmonize customs procedures and administration; (c) expand facilities at smaller customs border posts; and (d) for Bangladesh, bring down the high protective tariffs. Trade Liberalization Programme under SAFTA could facilitate this process. Trade financing is weak and transaction costs remain high. A sub-components of this study on the financing of India-Bangladesh trade points out that the hawala networks perform better than the formal banking system in terms of simplicity, speed, transaction costs, and reliability, and that for these reasons they are not only financing much of the informal bootleg smuggling trade from India to Bangladesh, but also substantial parts of the exports to Bangladesh that go through the legal routes. In practice, “the LC is a mere cover to move goods through Customs”, finds this study. If this is correct, they involve non-negligible transaction costs without protecting the suppliers and importers against commercial risks such as defective shipments, non-payment, delayed payments etc. Though SAFTA has been signed and ratified by the two countries, the possibility of a bilateral FTA between India and Bangladesh has been mooted and pursued with more or less vigour at different times. The economic implications of such an arrangement have not been clearly spelled out in the public discourse. The present study develops a methodology, by using industry case studies, to quantify the economic welfare implications of an FTA between the two countries. Free trade agreements discriminate against imports from rest of the world (ROW) and, in so far as the imports from the ROW countries that are excluded are traded at lower prices than the imports from the FTA countries, there is an economic welfare loss for the FTA members, and also an economic loss for the ROW exporters who lose their markets. These trade diversion effects need to be allowed for in any comprehensive evaluation of the costs and benefits of FTAs. For the few industry case studies simulated (cement, light bulbs, sugar, readymade garments) the likely effects of an FTA, for the first three, seem to be an expansion of Indian exports to Bangladesh, but no exports from Bangladesh to India. This was mainly because Indian export prices for these products were substantially lower than ex-factory before-tax prices of the same or similar products in Bangladesh. The simulations for ready made garments predict increased Bangladesh exports to India, but also increased RMG exports from India to Bangladesh. For Bangladesh: Consumer welfare gains far outweigh losses in government revenue or producer surplus, provided infrastructure and administrative capacities are expanded at the borders. Yet, welfare gains could vanish if, after getting a captive protected market under an FTA, Indian producers collude amongst themselves or with Bangladeshi importers. Bangladesh would be better served in pursuing similar welfare gains from multilateral liberalization. For India: India’s trade with Bangladesh is rather small relative to its total trade such that the economic welfare gains from an FTA are modest, largely stemming from gains in producer surplus due to expanded exports. India stands to gain from the continuation of its policies of unilateral liberalization paying special attention to the removal of non-tariff barriers, specific duties on textiles and garments, and prohibitive tariffs on agricultural products. India-Bangladesh cooperation in other areas. FTA or not, the study finds substantial benefits from coordinated improvements in the transport, storage and administrative infrastructures at and adjoining the India-Bangladesh land borders, as well as in harmonization and cooperation in Customs administration and banking relationships. A basic economic concept that involves multiple parties participating in the voluntary negotiation and then the exchange of one’s goods and services for desired goods and services that someone else possesses. The advent of money as a medium of exchange has allowed trade to be conducted in a manner that is much simpler and effective compared to earlier forms of trade, such as bartering. In financial markets, trading also can mean performing a transaction that involves the selling and purchasing of a security. Among India’s neighbours, Bangladesh occupies a special position—not only because of India’s role in its liberation but because geographically, too, it surrounds Bangladesh from three sides. The beginning of close economic relations between the two countries can be traced back to 1971. After its independence, Bangladesh’s requirements of consumer goods, especially food, came from India. Over the years, the country has sought easier access to Indian markets for its own products. It has been active in seeking duty reduction and elimination of non-tariff barriers that India imposes on imports from across the border. There already exists a bilateral trade agreement between Bangladesh and India which was signed in 1980 and later amended and signed in March 2006; this came into force on April 1, 2006 and is valid till March 2009. This agreement provides for expansion of trade and economic cooperation, making mutually beneficial arrangement for the use of waterways, railways and roadways, passage of goods between two places in one country through the territory of the other, exchange of business and trade delegations and consultation to review the working of the agreement at least once a year. Implementation of this agreement has the potential to aid trade and investment between the two countries. The rise in India’s exports to Bangladesh was facilitated by the opening up of the latter’s economy and reforms initiated in 1982. The appreciation of the real Taka/Rupee exchange rate by about 50 per cent between the mid-1980s up till 1999 also contributed to the expansion of both formal and informal Indian exports to Bangladesh and retarded the growth of Bangladesh exports to India. The exchange rate trend was reversed after 1999 but Bangladesh’s exports to India continued to stagnate. Bangladesh has often complained of various trade barriers, especially non-tariff barriers that India has imposed in the past. That is why the demand for ‘special treatment’ has dominated the talks between the leaders of the two countries. Reduction of trade barriers, especially non-tariff ones, would go a long way in boosting Bangladesh’s exports to India. Currently India is the 2nd largest trading partner of Bangladesh, and India’s position is at the top for Bangladesh’s imports trade. So the study underscores the trend, structure and current picture of Bangladesh-India trade. Bangladesh’s trade with India increased tremendously especially in the 1990s. The average annual growth rates of Bangladesh’s trade with India, during 1980 to 1995, were much higher than those with the SAARC and the world. The present situation is not a healthy situation for both of India and Bangladesh. This situation should be changed. Because we can see that India is getting a huge benefit from the trade situation which is existing right now. Bangladesh is suffering from the trade imbalance which may make the relationship between these countries to fall in a bad situation. And harmony of these two counties can be hampered and India can loss this market. So it should me alleviated thus both of Bangladesh and India can be benefited. From the Study we can get some idea how we can minimize the problem. To prepare this report the secondary data was collected from the different websites, and also some data has been collected from the publications of IPCA. A lot of data was collected from the website and business portal of India. Data has been collected from different articles published in different Daily newspapers and others. India is a large country. And almost three sides of Bangladesh is totally surrounded by India. India as the largest neighbor should maintain a healthy relationship with Bangladesh. But unfortunately it does not exist. The largest border of India is with Bangladesh. The culture and language between the West Bengal and Bangladesh are almost same. But there are some problems which make the tension between these two countries. One is Farakka Damn and another is the fencing which India is building in its border. As these two countries are maintaining such a large border so both the country should try to minimize their tension. India helped Bangladesh to achieve its independency in 1971. After that as a big neighbor we had an expectation from the Indian Government. Both Bangladesh and India are two major countries of the SAARC and have a long common historical past and similar cultural and social evolutions. As far as trade relation is concerned, India is the 2nd largest trading partner of Bangladesh just after USA in 2003. India’s position is at the top for Bangladesh’s imports from the world (IMF: Direction of Trade Statistics, June 2004). Therefore, an analysis of current trade status between the two nations, obstacles and opportunities for mutual trade expansion is very critical for economic development of both countries, especially of Bangladesh, as Bangladesh has been suffering from historical trade deficit with India since its independence. The trade deficit has been increasing exponentially since the recent past. Official data show that compared to 1983, trade deficit in 2003 is more than 46 time higher1 (IMF: Direction of Trade Statistics). This growing deficit is a cause of serious concern for Bangladesh and has important economic and political implications. Hence the importance of the study is realized, and it is expected that the study will help policy makers to understand the roots of the problems on the way of trade expansion, and to formulate and execute the appropriate policy measures to mitigate or remove these problems. Bangladesh and India signed the “ Treaty of Friendship, Cooperation and Peace” on March 19, 1972 in Dhaka for 25 years. Owing to this treaty, both countries signed the first one-year trade agreement on March 28, 1972.In the agreement, fish, raw jute, 1 In 1983, trade deficit of Bangladesh was US$31 million. In 2003, it increased to US$ 1435.83million. newsprint and naphtha were identified as the principle exports of Bangladesh to India. India’s major export items to Bangladesh, on the other hand, were cement, coal, machinery and unmanufactured tobacco. The trade between the nations was limited to government level (Madaan 1996). This agreement also provided border trade between Bangladesh and Neighboring Indian states; and within 16 kilometers of both countries’ border, free trade was allowed for certain commodities (Hassan 2002). The expected level of trade was not achieved under the first trade agreement. Also free border trade between Bangladesh and India led to some illegal trade and hence was abolished in October 1972 by mutual consent of the both governments. However, to attain the desired level of trade, the first trade agreement was further extended up to September 27, 1973 (Madaan 1996). The first trade agreement of 1972 was replaced by another trade agreement for three years. This agreement was signed on 5 July 1973 and became effective from 28 September 1973. Raw jute, fish, newsprint, etc were identified as major exportable items of Bangladesh to India. On the other hand, major exports of India to Bangladesh were unmanufactured tobacco, cement, coal, raw cotton, cotton yarn, cotton textiles and books. This agreement provided for a system of Balanced Trade and Payment Arrangement (BTPA) and ‘most favored nations treatment’ to each other (Madaan 1996 and Hassan 2002). The desired level of trade between the two nations was not achieved by the agreement of 1973, and trade imbalance increased in the very first year. Rupee trade was found to be a barrier in the bilateral trade, and thus abolished rupee trade from 1 January 1975 by a Protocol signed on 17 December 1974. It was decided that trade would be conducted in free convertible currency. India and Bangladesh signed another trade Protocol on 12 January 1976 for higher volume of trade and long-term arrangements for trade of coal and newsprint. BTPA between Bangladesh and India was extended for another three years till 27 September 1979 on 5 October 1976. On 4 October 1980, the third trade agreement was signed between these two nations initially for three years. By mutual consent, this agreement was extendable for another 3 years. On 8 November 1983, Bangladesh and India renewed a Protocol on trade of 1980 for further three years. In May 1986, the trade agreement of 1983 was extended for another three years till 3 October 1989. Subsequently this agreement was renewed a number of times. Based on available information, this agreement was valid up to 3 October 2001. So far, there have only been three cases involving SAARC countries, two in Nepal, and one in Bangladesh. The Bangladesh case was finalized in December 2001, and involved Indian imports of lead acid vehicle batteries from Japan, Korea, China and Bangladesh. Anti-dumping duties were imposed on all imports from the four countries, and in the case of the Bangladesh firm these were prohibitive and blocked all subsequent exports to India. Highly variable but sometimes large imports of cereals (mainly wheat and rice) from India. Bangladesh is also importing from other countries, but India has been the main supplier in recent years. An apparently declining role of India as a supplier of duty free intermediate goods (mainly textiles) for Bangladesh’s export RMG sector. According to Bangladesh’s import statistics, India is supplying fairly constant shares of Bangladesh’s imports of basic raw materials, intermediate goods used for domestic production, capital goods and non-cereal final consumer goods. However, according to India’s export statistics, exports of these products have been growing considerably faster than indicated by the Bangladesh import statistics, on average at around 15% annually since 1996/97, with especially big increases in 2002/03 and 2003/04. India exports a wide range of products to Bangladesh. According to the Indian export statistics for 2003/04, there were at least some exports in all but 4 of the 98 HS chapters. About a third of total exports were primary agricultural, fish and livestock products, 6.6% processed foods and drinks (including animal foods), and most of the rest manufactured products. Leaving aside textile and clothing exports, most of which go duty free to Bangladesh RMG exporters, India was supplying 21.5% of Bangladesh’s total recorded imports for use in the domestic market. Adding unrecorded smuggled imports, the Indian share of total imports for the Bangladesh domestic market is plausibly between 30% and 35%. This means that Indian exporters to Bangladesh are successfully competing with exporters in the rest of the world (ROW) and have achieved substantial shares in Bangladesh’s import markets, while in most cases paying relatively high tariffs which in principle are the same for all exporters. If Bangladesh’s MFN tariffs for the rest of the world were to remain the same while India received duty free treatment under SAFTA or a bilateral FTA, for most of these products Indian exporters would have a substantial price advantage in products in which it appears from the trade data they are already highly competitive. An NCAER survey asked Indian traders who were already exporting to Bangladesh by what percentage they would expect their exports to expand under three different hypotheses on Bangladesh. Tariff reductions (50%, 75% and 100%). For the free trade alternative (100% tariff reduction) the average estimated increase for 58 products was 34 %, distributed as follows: agricultural products 31%, processed foods 45%, manufactures 35%. These responses underline the considerable potential for trade diversion with an FTA i.e. the probability that Indian exporters would be able to undercut ROW suppliers and substantially increase their shares in Bangladesh’s import markets. On the basis of 2003/04 trade data, before allowing for market share increases, a very rough estimate of the Bangladesh government import duty revenue loss is $207 million. It would be greater than this to the extent that Indian exporters increase their import market shares. Since 2001/02 Bangladesh’s officially recorded exports to India have been increasing fairly rapidly, and this increase was sustained until fiscal year 2005/06 when it rose to around $200 million. However, it was from a very low level of only $50-60 million in 2001/02. It is still a miniscule share of India’s total imports (less than 0.1%) and only about 1% of Bangladesh’s total exports. About two thirds of Bangladesh’s exports to India consist of just two products, anhydrous ammonia (which is imported duty free as an input into India’s urea industry) and raw jute. According to the various informal trade surveys, smuggled merchandise exports from Bangladesh to India by the bootleg route are also very low. The very low level and slow growth of Bangladesh’s exports to India is not necessarily attributable to restrictive import policies in India. • For industrial products without SAPTA preferences, Indian industrial MFN tariffs came down from 44.9% in 20001/04 to 30.8% in 2003/04, to 20% in 2004/05, and to 12.5% in 2006/07. Despite this steep decline only 7 Bangladesh industrial products without SAPTA preferences appear in India’s 2003/04 import basket, and then at very low annual import levels of no more than about $300,000 per product. • Most of India’s 2925 (HS 6-digit) SAPTA preferences for Bangladesh are on industrial products, and the most frequent concession rate is 50%. Assuming this preference rate, a typical Indian industrial preferential tariff for Bangladesh has declined during the past five years from 23% to 7.5%. Despite this, only seven industrial products with preferences appear among India’s principal imports from Bangladesh in 2003/04, and the imports of each of these were less than $500,000. This almost complete absence of response of Bangladesh exports to the numerous and fairly substantial Indian preferences under SAPTA, and to the decline of the preferential tariffs over the period, suggests that currently Bangladesh producers are probably not producing many products that are in demand in India. Alternatively, if these products are being produced in Bangladesh, it seems that, despite declining Indian tariffs, Bangladesh producers’ costs are too high to compete with Indian producers, or with exporters in other countries who have to pay the higher MFN tariffs. • Three quarters of Bangladesh’s exports are ready made garments, most of which go the US and Europe. Bangladesh RMG producers appear to have a marked labour cost advantage over RMG producers in India, owing to lower wages and similar labour productivity, but India’s specific duties on garments appear to have prevented any substantial penetration of its domestic markets by developing country clothing producers including Bangladesh. Under SAPTA, Bangladesh RMGs benefits from Indian preferences –mainly either 50% or 60%-and these are applied to reduce both the ad valorem and the specific components of compound tariffs. Presumably helped by this protection and the SAPTA preference advantage, Bangladesh RMG exports to India-almost entirely woven cotton shirts -grew fairly rapidly after 1999/2000 up to 2003/04, but the total level in that year ($4.57 million) was still tiny both in relation to the Indian domestic RMG market and to Bangladesh’s total RMG exports. This suggests that high protection levels provided by India’s specific duties on garments are mostly redundant by wide margins. That is, actual domestic prices in India are probably not far above and may even be below prevailing international prices at the cif stage in India. It is also relevant that Sri Lanka-which is a major RMG exporter- has had negligible RMG exports to India, despite the 75% preference for garments negotiated under the Sri Lanka-India FTA. In 2004 India’s officially recorded exports to Bangladesh were about $1.7 billion but its imports from Bangladesh were just $78 million. Indian exports to Bangladesh grew very rapidly during the 1990s, and have continued to grow since 2000 (Fig 2.1). By contrast Bangladesh exports to India-almost zero in the early 90s-have stagnated at very low levels at well below $100 million annually. In inflation adjusted US dollars they are presently about the same as they were 20 years ago during the 1980s. Since 1996/97 Indian exports to Bangladesh (in nominal US dollars) have been growing at 9.1% annually, just slightly above the general rate of growth of its total merchandise exports (8.4%), but India’s imports from Bangladesh over the same period have grown on average at only 3% annually, compared to average growth of its total imports of 9.2%. Consequently Bangladesh’s bilateral trade deficit with India has been increasing rapidly, on average at about 9.5 % annually. For India, trade with Bangladesh is a very small part of its total trade-just over one percent since the mid-1990s, and currently about 3 percent of its total exports and a miniscule share (0.01%) of its total imports (Fig 2.2). For Bangladesh (Fig 2.3) however, India has now become the largest single source of its imports (about 16% of the total, ahead of China and Singapore) and accounts for about a tenth of its total trade, despite exports to India which have declined to only slightly above 1 % of total exports. There already exists a bilateral trade agreement between Bangladesh and India which was signed in 1980 and later amended and signed in March 2006; this came into force on April 1, 2006 and is valid till March 2009. This agreement provides for expansion of trade and economic cooperation, making mutually benefi cial arrangement for the use of waterways, railways and roadways, passage of goods between two places in one country through the territory of the other, exchange of business and trade delegations and consultation to review the working of the agreement at least once a year. Implementation of this agreement has the potential to aid trade and investment between the two countries. India, on its part, has committed itself to progressively reducing tariffs and non-tariff barriers at the various SAARC summits. At the 14th SAARC summit held in New Delhi in April 2007, India announced that it would grant duty-free access to Bangladeshi imports that are on the `positive’ list. India has also agreed to slash import duty on the `negative’ list (Sensitive List) from 45 per cent to 10 per cent.1 In fact, India decided to grant zero tariff access for products in the positive list to all the Least Developed Countries (LDCs) of SAARC. While India, Pakistan and Sri Lanka are categorized as Non-Least Developed Countries (NLDCs), Bangladesh, Bhutan, Maldives and Nepal are categorized as the LDCs. This unilateral gesture by India is in keeping with the trade liberalization and investment enhancing measures that SAFTA embodies towards the LDCs of the region, and it has come much before the scheduled date of 2009. Article 7 of the SAFTA Agreement provides for a phased tariff liberalization programme and covers all tariff lines except those kept in the Sensitive List by the member states. SAFTA was signed by all the member states of SAARC—India, Bangladesh, Bhutan, Maldives, Nepal, Pakistan and Sri Lanka—during the 12th SAARC Summit held in Islamabad in January 2004 and came into force from January 1, 2006. India’s unilateral move should aid in easing trade relations with all the LDCs of the region, and in particular boost economic relations with Bangladesh. Geographical proximity and cultural affi nity between the people of Bangladesh and West Bengal, who speak a common language, would also greatly enhance bilateral trade. A huge amount of illegal border trade, amounting to more than $1 billion, already takes place between the two countries. Among its neighbours, India shares the longest land boundary with Bangladesh—stretching 4,096 km. At many places, the border is porous, making it easy for people to cross over and return to their place of domicile frequently. India and Bangladesh could be natural trade partners due to geographical proximity and ethnic ties; there exists a certain degree of trade complementarity between the two. However, Bangladesh’s imports from India are much higher than India’s from Bangladesh. This is obviously because it has a much smaller resource and industrial base as compared to India. However, certain types of goods from Bangladesh are increasingly finding a ready market in India. Now Bangladesh’s exports to India are rising much faster than India’s exports to Bangladesh. India’s exports to Bangladesh were valued at $ 1,631 million in 2004-05 and rose to $ 1632.4 million in 2005-2006. During the same period, imports from Bangladesh rose from $59.3 million in 2004-05 to $ 118.7 million in 2005-06 which is almost double. Bangladesh has also increased its trade with Singapore and China in recent times. The trade volume between China and Bangladesh was US $3.2 billion in 2006 which was an increase of 29 per cent over the previous year. The trade surplus that India has had with Bangladesh over the years, however, is a sore point in the relations between the two countries and has been the cause of much adverse comments in Dhaka. Between 1980 and 2004, while trade between the two countries grew, the rate of growth of India’s exports to Bangladesh was much higher. In 2004, India’s exports to Bangladesh (officially recorded) were worth about $1.7 billion but its imports were valued only at $78 million. Since 1996-97, India’s exports to Bangladesh have been growing at 9.1 per cent per annum, slightly above the average rate of export growth of its merchandise exports (8.4%). However, India’s imports from Bangladesh over the same period have grown at an average rate of just three per cent annually compared to the average growth rate of its total imports at 9.2 per cent. The trade gap has risen for Bangladesh, an average of 9.5 per cent annually since 1996/97. While India’s share in Bangladesh’s imports rose from 3.6 per cent in 1980 to 18.5 per cent in 2004, Bangladesh exports to India in the entire decade of 1990s remained less than one per cent of India’s total imports. The trade gap rose from $88 million in 1980 to over $1 billion in 2004. Bangladesh began exporting basic manufactures, including leather, rubber, paper and chemicals in the 1980s. Gradually, the list has grown and Bangladesh today exports medicines, textiles, iron and steel, metals, raw jute, Jamdani sarees, medical appliances and clothing accessories. These have found a growing market in India. Bangladesh imports from India food grains, fabrics, cotton yarn, machinery, instruments, glass and glassware, ceramics and coal. Whether the trade between the two countries after the duty free access would be enhanced will depend on various factors, including better transport facilities and other additional trade facilitation measures. Much will also depend on whether Bangladesh’s exports have a real comparative advantage and whether there is trade complementarity between the two countries. Prospects for bilateral trade to rise are greater when one country has a clear comparative advantage in products that figure prominently in the import structure of another country. India has a ‘revealed comparative advantage’ in many goods which is why Indian imports to Bangladesh have been growing over the years. Bangladesh, on the other hand, has relatively limited scope for enhancing its exports because it lacks a similar `revealed comparative advantage’. Complementarity between the two countries is also limited. Trade complementarity exists when the supply capability of a particular country matches well the demand capability of its trading partner and the supply capability of the trading partner matches well with the demand potential of the former. It is possible that the supply capability of a particular country matches well with the demand potential of its trading partner but not vice-versa. Thus, there could exist between the two countries a situation of partial complementarity. In the case of India, it has a strong potential to meet Bangladesh’s import demands but there is a major lack of such potential on the part of Bangladesh. Studies have shown that India’s exports match Bangladesh’s imports fairly well but there is a clear lack of complementary in Bangladesh’s exports to India. It is a clear case of partial complementary. India, perhaps, needs to help Bangladesh in achieving a higher degree of complementary by encouraging greater Indian investment in Bangladesh. The duty free entry of Bangladeshi goods into India will mean a significant reduction in the informal trade that is taking place between the two neighbours. The pattern of informal trade follows the pattern of formal trade as large volumes of goods are being smuggled from India into Bangladesh but much smaller volumes are being smuggled in the other direction. There is thus a substantial Indian trade surplus in the informal account as well. Apart from cross-border smuggling, the practice of over and under- invoicing in formal trade makes a significant contribution to the volume of informal trade. Bangladesh’s exports to India, however, have not been constrained by tariff protection. India has been giving Bangladesh extensive tariff preferences under SAPTA (South Asian Preferential Tariff Arrangement, which was a precursor of SAFTA) and many of the tariff barriers applicable to other countries have not been faced by Bangladeshi exporters. This shows that India’s trade policy has not been discriminatory towards Bangladesh and that the slow growth of the latter’s exports to India is due to other factors like lower degree of complementarity and weak comparative advantage. India has dismantled most of its tariff protection regime in industrial goods.9 It has also brought down its general tariff level and Indian markets are full of imported goods from all over the world. Bangladesh will have to compete with foreign goods in the Indian markets, which could prove difficult even with zero duty access. As for agricultural goods, India still maintains a protectionist regime which is in accordance with WTO rules. Although Bangladesh has been the main beneficiary in the recent move by India to reduce tariffs in most goods, in garments, which comprise the bulk of Bangladesh’s exports, the duty reduction has not been drastic as it remains in the negative list.10 The ‘rules of origin’ clause embodied in SAFTA acts as a non-tariff barrier in the case of garments from Bangladesh. For giving preferential access to the member countries under SAFTA, it is important that goods should have undergone a substantial manufacturing process in the exporting countries. Value content has to be 30 per cent for LDCs. This means that the import content of made ups should not be more than 70 per cent of the fob price or the landed price and if it is so, it can disqualify many products with less than value addition of 30 per cent in Bangladesh. The ‘rule of origin’ clause, however, could give an incentive to Bangladeshi exporters to source the fabrics from India. India has also offered Bangladesh market access for eight million pieces of garments; three million pieces with the condition of sourcing fabrics from India. An additional three million garments have been granted access with the condition of using fabrics of either Indian or Bangladesh origin and a further two million pieces without any condition. India could set up industries in Bangladesh that have a high intra-industry trade and trade index. The goods produced when exported back to India could reduce the trade imbalance. Better transport links would help bring about an increase in trade between the two countries. The problem of traffic congestion can be handled with check-posts undertaking expeditious clearance. India is planning to establish state-of-the-art integrated check-posts on the border with Bangladesh. The check-posts will give clearance to goods, services and even people; India plans to give passports to truckers to operate across the India-Bangladesh border. It would also reduce transaction costs. This move by the Indian government may reduce the serious administrative constraints faced by exporters in Bangladesh because 38 out of the 42 customs posts along the border with India have only restricted custom clearance. Only four land border posts are presently there to clear all imported goods. In terms of volume, the most important customs posts with comprehensive customs clearance are at Benapole in Bangladesh and Petrapole in India, located on the main road linking Kolkata with Jessore and Dhaka. There is the additional problem of sea-borne trade as certain products have to go to specific ports for customs clearance. This problem faced by exporters has given rise to bootleg smuggling which bypasses customs posts altogether or even “offi cial smuggling” involving bribes to customs and other offi cials on both sides of the border. Trade between the two countries has also been constrained by the lack of transhipment facilities between Bangladesh and India. If such facilities were granted, trade between India and its own North East could become a major source of revenue gain for Bangladesh.14 For example, tea from Assam travels 1,400 km to the Kolkata port whereas the distance could be curtailed by 60 per cent if access to Chittagong port was available. Secondly, goods from Agartala travel 1,645 Km to Kolkata, while the direct distance would be 350 km if Bangladesh allows through movement. Opening up access through Chittagong port could provide an incentive to exploit natural resources in North-East India as well as northern Myanmar, for mutual benefi t. Bangladesh could pick up containers from Kolkata and deliver to the North-East in India. This would lead to possibilities of increased investment by India. Promoting investment in telecommunications and Internet Communications Technology sector between the two countries would enhance economic relations further. ICT could be used to alleviate poverty. The Bangladesh experience of Grameen Phone could be used in this regard and NGOs could play an important role for providing connectivity to the rural area to reduce the digital divide. There are several bilateral issues with India, according to Bangladesh, that need to be resolved. These include India’s proposed river-linking mega project involving common rivers, sharing the waters of common rivers, implementation of the 1996 Ganges Treaty, Implementation of land boundary demarcation under the 1974 Land Demarcation Agreement, delimitation of maritime boundary, India’s fencing of the international land boundary and the ‘illegal’ presence of millions of Bangladeshis in India. Opening up of trade further by giving duty-free access to Bangladesh’s exports is one important way of bringing about closer economic ties that could help in tackling other bilateral issues. Politically, Bangladesh remains a very important country to India and its potential of becoming an important trade and investment partner in the future could be initiated by exchanges and dialogue between prominent members of civil society in the two countries. Finally, for SAFTA to be really effective, it has to offer much more than what other competing regional arrangements are offering to countries like Bangladesh. It should also pave the way for greater regional cooperation in vital areas like energy, infrastructure, human development and poverty alleviation. Although the trade deficit with a particular country is not bad if the over all trade balance is satisfactory, yet from the distribution aspect of trade policies (the distribution of benefits and cots among groups of producers and groups of consumers) the growing trade deficit with India is a great concern for Bangladesh. Bangladesh’s fear is that if this deficit continues, Bangladesh will be dependent only on a few products for its exports, and imports from India displace domestic production to such an extent as to deindustrialize Bangladesh. As a result, it is argued, a severe polarization in Bangladesh and high levels of unemployment will occur. Therefore, increasing trade deficit with India is a problem, and attempts are made here to find out the causes of this problem. Bilateral exchange rates between Bangladesh and India during 1986 to 1999 have been presented in Table 13 in order to explore the dynamics underlying this expansion of trade imbalance between these two countries. Available data exhibit that the nominal and real values of the Bangladesh’s Taka vis-à-vis the Indian Rupee have been appreciating, with negligible exceptions, over the years. This appreciation of Taka has a significant positive effect on the increased trade deficit of Bangladesh with India. It is evident from the table that the nominal exchange rate, Taka per Rupee, had been continuously declining right from 1986 to 1996. In 1997, though it increased slightly, it started to decline again from 1998. This declining trend of the exchange rate implies that Taka had been appreciating. In nominal term, the exchange rate decreased to 1.140 in 1999 from 2.411 in 1986 indicating a 52.71 percent appreciation of Bangladesh’s Taka against Indian Rupee during 13 years of time. The downward trend of real exchange rate was also observed from the Table 13. In real term, Taka appreciated 31.72 percent against Indian Rupee in 1999 compared to 1986. Thus the appreciation of Taka, both in nominal and real terms, might have contributed to the growing trade deficit of Bangladesh. It is true that both Bangladesh and India depreciated their currencies over the years, but depreciation had been stronger in Indian than in Bangladesh. Hence Bangladesh’s exchange rate policy is inappropriate compared to that of India resulting large trade deficit. India’s products became more competitive than that of Bangladesh, both in terms of bilateral trade and with each country’s trade with the rest of the world. Thus India has become successful to divert demand from imported goods to domestic goods and to take away jobs and income from its trading partners. The productivity differences can also best explain trade patterns between countries. India has productive advantages both in agriculture and industry compared to Bangladesh because of scale economies (Eusufzai 2000). Structurally Indian economy is much larger, more diversified and technologically advanced. Indian products now have become globally competitive both in terms of price and quality. Also geographically India is very closed to Bangladesh, and Bangladesh’s importers are very familiar with Indian products and production capacities. All these factors have made Indian products very competitive in Bangladesh’s market (Hassan 2002). As a result, India’s exports to Bangladesh are more diversified and consists of high value added manufactured goods. On the other hand, India’s imports from Bangladesh are limited to a few items, as Bangladesh does not have a large supply base to offer a wide variety of products to India. The obvious result is an increase of trade imbalance between the two nations. Historically, both Bangladesh and India used to follow a similar type of import substituting industrial policy. They, however, started to move towards more liberal trade policies since the 1980s along with the worldwide move towards more open economies. General tariff trends: The drastic tariff reductions of the early 1990s stalled after 1995/96, and during the following ten years up to 2004/05, tariffs declined only slightly. Average industrial tariffs came down modestly but the average protective rate for agriculture (including fisheries, livestock and processed foods) was 32.7% in 2004/05, slightly higher than it had been 10 years earlier. By July 2006, the unweighted average protective rate over all tariff lines declined by 7.7 percentage points, from 32% to 24.3%. Para-tariffs: This slowing of tariff reduction occurred because continuing cuts in Customs duties were offset by increases in the scope and levels of a variety of para-tariffs which were imposed on top of Customs duties. By 2004/05 about 40% of the unweighted average protection level was due to para-tariffs, and para-tariffs were being applied to 21% of total tariff lines. The para-tariffs have been principally but not exclusively used to provide extra protection to domestically produced consumer goods. As a result, during the 10 years since 1995/96 there has been no downward trend in the average protection rate of consumer goods (Fig 2) despite reductions in Customs duty rates during the period and the discontinuance of the license fee in 2002/03. By contrast the average protection rates on basic raw materials, intermediate goods and capital goods are much lower, and in the case of raw materials and intermediate goods have been trending down since 1998/99. Non tariff barriers: During the late 1980s and early 1990s, import licensing system was abolished. Of the continuing QR restrictions the most important were the parastatal import monopoly over sugar and the ban on textile fabric imports for use in the domestic market, which protected the textile industry. The sugar import monopoly was removed in September 2003 and the import ban on textile fabrics in January 2005, both being replaced by very high tariffs. But there are still QRs on the import of chicks, eggs, salt,. Various permits, clearances and approvals are also required for extensive lists of other products, even though they are not formally subject to import licensing. In the various studies undertaken as part of this project, except for sugar and textile fabrics, explicit QRs did not emerge as an impediment or special issue either for Indian exporters or in Bangladesh, possibly because the products still subject to QRs were not covered in the studies..
Customs clearance at land border Customs posts The land border trade is subject to very serious administrative constraints in Bangladesh, because 38 out of the 42 land border Customs posts with India severely restrict the imported goods that can be cleared, and only four land border posts can clear all imported goods. In terms of volume the most important by far of the Customs posts with comprehensive Customs clearance powers is at Benapole, which borders Petrapole on the Indian side and which is on main roads linking Kolkata with Jessore and Dhaka. In addition to these general constraints on imports by the land border, both Bangladesh and India have periodically constrained imports of certain products by specifying the ports at which they can be cleared by Customs. This in turn provides a strong incentive to send the goods illegally, either by “bootleg” smuggling which bypasses the Customs posts altogether, or by “official” smuggling involving bribes to Customs and other officials on both sides of the border. It is generally agreed that Bangladesh has initiated the program of tariff liberalization earlier than India- in the mid 1980s, and the speed of liberalization in Bangladesh is faster than that in India. Bangladesh has continued this higher speed of liberalization till recent years (Rahman 1998 and Eusufzai 2000, Dasgupta 2000). This is evident from the Table 14, which shows a comparison of nominal rates of protection (simple average and import weighted average) for both countries in three different sectors. The table shows that Bangladesh sharply reduced its tariff rates in all categories of imports in FY1996 compared to FY19912. For intermediate and capital goods, both for the unweighted average and the import-weighted average, Bangladesh exhibited a slightly higher speed of liberalization than India. Tariff reduction in consumer goods sector though seems higher in India than in Bangladesh during this period, there were significant quantitative restrictions on consumer goods imports in India. Recently Indian commodities, compared to the world’s commodities, faces lower average tariff restrictions in Bangladesh. Table 15 compares the dynamics of decline in the average import weighted tariff imposed by Bangladesh on its imports from the world and India. It is observed that Indian imports faced a higher rate of tariff (31.16%) compared to the world average (24.14%) in FY 1992. However, import weighted tariffs on imports from India were lower (12.05%) than that from the world (17.33%) by FY 1996. This reverse scenario came because of almost 60 per cent decline of import weighted tariff rate between FY1994 and FY1995 on imports from India compared to 14.70 per cent decline on imports from the world (Eusufzai 2000). There are many non-tariff barriers (NTBs) in India that Bangladeshi exporters are to face to enter into Indian markets. These NTBs are real cause of concern for Bangladesh’s business community. In Table 16, five types of such NTBs are mentioned that are imposed on imports of India. Rahman (1998) notes that there are thousands of items under these NTBs, and Bangladeshi exporters are generally unhappy with these NTBs as there is lack of transparency and clarity with regard to application of these NTBs because customs authorities in India mainly apply these according to their own discretion. Though significant fiscal reforms took place in the 1990s in India, trade policy pursued by Indian government is considered as highly complex and restrictive. Among other NTBs, the rules of origin (ROO) issue and infrastructural bottlenecks deserve to be mentioned here for huge trade deficit of Bangladesh with India. According to SAPTA agreement, local content in the exported goods has to be at least 50% of f.o.b. value of the product in order to receive preferential treatment / tariff concession. If goods are processed in more than one member country, the aggregate content originating in the member country must be a minimum of 60% of its f.o.b. value (Rahman 1998). As the manufacturing base of Bangladesh is not strong enough as India, this ROO criterion limits the export expansion of Bangladesh to India. This is particularly true for exports of some cosmetic goods and toiletries, where Bangladesh has achieved notable expertise, and India has a huge market for this kind of products. Inadequate infrastructure in Bangladesh also imposes sever limitations on trade expansion with India. There is severe lack of facilities of infrastructure in all land-routes, except Benapole. Severe limitations also exist in storage facilities. As a result, enhancing exports from Bangladesh to India is being constrained. Outputs of domestic industries, the government has developed a system of special “end user” tariffs which provide low concessional tariffs on the inputs and capital equipment for specified industries or for specified uses. These concessional tariffs are much lower than normal MFN tariffs, and in the case of machinery and parts used by exporters, the concessional tariff is zero. However, there are only two major industries which receive special end-user concessions for their intermediate materials, namely the pharmaceutical industry and the insecticide industry. Bangladesh has well developed systems (mainly export processing zones and bonded warehouses) for providing duty free intermediate materials for its export firms, and this is not handled as part of the “end user” concessional tariff system..
Agriculture, livestock, fisheries and processed food. Bangladesh’s trade policies in these sectors warrant separate treatment because, as in India, they differ in important ways from its manufacturing trade policies, in addition to which Indian agricultural products are generally a large although fluctuating share of its total exports to Bangladesh. The high protection rates for some of the agricultural and other primary products, but especially of processed foods, from the viewpoint of Bangladesh consumers constitute a substantial and highly regressive indirect tax. This has important implications for the likely economic effects of an FTA with India, because if Bangladesh were to import these products duty free there could be large economic welfare benefits for Bangladesh consumers, but also difficult adjustment problems for the Bangladesh producers that lose protection. How the resulting economic costs and benefits might work out is discussed in a project case study paper using the example of the sugar industry. By contrast, it is probable that not much would change for Bangladesh consumers or for producers, if rice and Bangladesh’s other cereal crops were included in an India-Bangladesh FTA, because of the Bangladesh protection levels that are already quite low. Bangladesh’s tariff preferences for India. Bangladesh gives tariff preferences to imports from India under the Bangkok Agreement and under SAPTA. Overall, the tariff preferences Bangladesh has given to India (and to the other member countries) under both the Bangkok Agreement and SAPTA are purely symbolic: their main effect has been to further increase the complexity of the tariff schedule and Customs administration rather than to provide any substantive preferences for imports from India of any of the other Bangkok Agreement or SAPTA countries. Export policies Bangladesh’s exports are dominated by ready made garments, most of which are exported to the US and the EU. Nearly all garment exports are from firms operating in export processing zones or as bonded warehouses. In both cases they can import their textile and other inputs free of Customs duties and all other import taxes (including the 3% advance income tax) with the use of “back-to-back LCs” i.e. letters of credit based on LCs issued for their exports. As noted previously, machinery used by exporters is also exempt from all import taxes under the “capital machinery” provision for exporters. There is also a 5% subsidy on domestic fabrics used by garment exporters. Apart from these, there is a standard array of duty neutralization schemes (e.g. duty drawback) and export incentives (e.g. preferential export credit) and export promotion institutions and activities of the kind used in many developing countries (see the trade policy Overview report for a summary). In addition, however, there are a number of non-standard export policies which would need to be discussed with India in the context of bilateral FTA, or with the India and the other South Asian countries in the context of SAFTA. These combine export bans and restrictions on a number of unprocessed or partially processed primary products and export subsidies when some of these products are exported in processed form. The intention of these measures is to make processed exports more profitable by increasing gross margins by lowering the prices of the raw materials and increasing the return from the exported finished products, but both measures contravene WTO rules and the Agreement on Agriculture in particular. They are also likely to run into trouble if used to promote exports to India or to one of the other South Asian countries as part of a free trade agreement. India is now the largest single source for Bangladesh’s imports (16% of total in FY05), ahead of China and Singapore. Bangladesh’s perennial large bilateral trade deficit with India might be a cause for concern but it has not led to any balance of payments problem for Bangladesh as consistent trade surpluses with such trading partners as US and EU compensate for these deficits. The large volume of informal/illegal trade remains a problem though. Bilateral Taka/Indian Rupee REER play an important role in affecting trade flows between India and Bangladesh. The appreciation of the real Taka/Rupee exchange rate by about 50% between mid-1980s up to about 1999, would have contributed to the expansion of both formal and informal Indian exports to Bangladesh, and retarded the growth of Bangladesh exports to India. 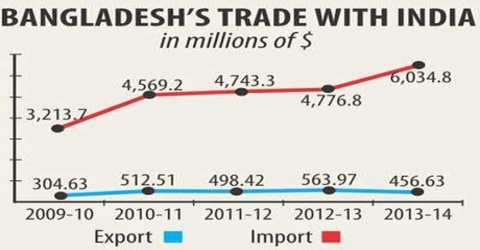 Despite a reversal of exchange rate trend since 1999, Bangladesh exports to India stagnated. This could be due to (a) faster productivity growth in India bolstering India’s comparative advantage in competing goods, and/or (b) tariff and non-tariff barriers constraining Bangladesh’s major exports (RMG) or minor exports which have experienced rapid growth elsewhere. Import policies. While liberalizing its import regime, India has used WTO-compatible rules for “contingent” protection – e.g. anti-dumping, standards. Though industrial tariffs in India are now mostly at 15%, specific tariffs on garments make it difficult for Bangladeshi garment exports to penetrate the Indian market. Export policies. India restricts the widely used DEPB scheme for exports over land routes –Petrapole being the only land border at which this duty neutralization scheme is allowed. Rebates under duty neutralization schemes have fallen considerably suggesting that domestic prices are close to fob prices and well below cif prices making it difficult for Bangladeshi exports to India to compete in the Indian market. Quite apart from the general constraints at land borders, both India and Bangladesh resort to limiting certain imports via designated land ports thus encouraging illegal imports – both cross-border and technical smuggling. Though custom duties have been brought down, para-tariffs imposed on top of custom duties, have led to a slowdown in reduction of protection since the mid-nineties. India exports a wide range of products to Bangladesh covering all but 4 of the 98 HS chapters, making up nearly 15% of Bangladesh’s imports, excluding textiles, which mostly come in at zero tariffs. India is supplying a fairly constant share of Bangladesh’s imports of basic raw materials, intermediate goods, capital goods and non-cereal consumer goods. This despite the fact that dutiable imports from India face import weighted tariffs of about 29%, suggesting that they compete favorably with imports from the rest of the world. Bangladesh granted few – mostly symbolic — tariff concessions to India under SAPTA. Bangladesh exports a miniscule (<1%) share of India’s imports, a negligible share (1%) of its own exports, and a small range of products (fertilizer and jute goods made up two-thirds of exports). Bangladesh exports to India face tariffs of 15% for industrial products without SAPTA preference. That negligible amounts get exported suggest that they face major competition with imports from ROW. But, for goods with SAPTA preference and a rate of only 7.5%, there are not much exports either. Bangladesh business leaders tend to argue that SAPTA coverage is irrelevant as it excludes exports of interest to Bangladesh. For instance, specific tariffs on textile and garments keep off competitive imports from other developing countries, including Bangladesh. Bangladesh exports are dominated by RMG exports which import all raw materials under the bonded system free of custom duties. A 5% export subsidy exists on domestic fabrics/yarn used by garment exporters. Besides, there is an array of subsidies and bans on primary products (wet blue leather) which would have to be discussed with India in the context of an FTA or SAFTA. Informal and illegal trade between India and Bangladesh is substantial and, by some estimates, could be as high as three quarters of recorded trade. It is mostly one way — from India to Bangladesh. Quite apart from the well-known cross-border informal trade, this study notes the existence of significant volumes of illegal imports into Bangladesh through legal channels (technical smuggling) by under-invoicing, misclassification, and bribery of customs. The study finds that preferences for formal trade will be influenced by the levels of Bangladesh protective tariffs, rigor of customs administration, and the state of infrastructure at border posts (roads, storage, technical and administrative capabilities). For Bangladesh, bring down the high protective tariffs. Trade Liberalization Programme under SAFTA will facilitate this process. A study of the financing of India-Bangladesh trade points out that the hawala networks perform better than the formal banking system in terms of simplicity, speed, transaction costs, and reliability, and that for these reasons they are not only financing much of the informal bootleg smuggling trade from India to Bangladesh, but also substantial parts of the exports to Bangladesh that go through the legal routes. If this is correct, they involve non-negligible transaction costs without protecting the suppliers and importers against commercial risks such as defective shipments, non-payment, delayed payments etc. The study made a detailed comparison of the Indian and Bangladesh statistics of bilateral trade. The purpose was to check any major discrepancies as to the general level of, and trends in, the total recorded trade. Such a comparison could throw light on the scale and scope of over-invoicing, under-invoicing, and similar practices, the likely products involved, and more broadly the potential scale of “technical smuggling”. There was greater convergence between Bangladesh export data and Indian import data. But discrepancies were found, at both the aggregate and product level, between Bangladesh import data and Indian export data. Bangladesh Bank import statistics appeared to be more complete than NBR data which did not fully record bonded imports from India. A methodology was developed to quantify, by using industry case studies, the economic welfare implications of an FTA between the two countries. Free trade agreements discriminate against imports from rest of the world (ROW) and, in so far as the imports from the ROW countries that are excluded, are traded at lower prices than the imports from the FTA countries, there is an economic welfare loss for the FTA members, and also an economic loss for the ROW exporters who lose their markets. These trade diversion effects need to be allowed for in any comprehensive evaluation of the costs and benefits of FTAs. The following industry case studies simulated the likely effects of an FTA: cement, light bulbs, sugar, readymade garments. For the first three, it turned out that under an FTA there are expanded Indian exports to Bangladesh, but no exports from Bangladesh to India. This was because (a) India was exporting all these products to the rest of the world and –except for cement — also to Bangladesh; and (b) Indian export prices were substantially lower than ex-factory before-tax prices of the same or similar products in Bangladesh. The simulations for ready made garments predict increased Bangladesh exports to India, but also increased RMG exports from India to Bangladesh. Implications for Bangladesh. The static simulation results show export expansion for India in all products except garments. In these instances, consumer welfare gains far outweigh losses in government revenue or producer surplus in Bangladesh. But these gains could be extremely limited unless infrastructure and administrative capacities are expanded at the borders. Yet, by providing a captive protected market to Indian suppliers under an FTA, the possibility arises of collusion amongst Indian producers or between them and Bangladeshi importers, thus shaving off some of the welfare gains. Bangladesh would be better served in pursuing similar welfare gains from multilateral liberalization. Implications for India. India’s trade with Bangladesh is rather small relative to its total trade such that the economic welfare gains from an FTA are modest, largely stemming from gains in producer surplus due to expanded exports. Even in the RMG case, consumer gains are limited thanks to the general openness of India’s current trade policies. India stands to gain from the continuation of its policies of unilateral liberalization paying special attention to the removal of non-tariff barriers, specific duties on textiles and garments, and prohibitive tariffs on agricultural products. India-Bangladesh cooperation in other areas. The arguments against FTA and in favour of multilateral liberalization notwithstanding, immense possibilities exist for gainful bilateral economic cooperation. The study finds substantial benefits from coordinated improvements in the transport, storage and administrative infrastructures at and adjoining the India-Bangladesh land borders, as well as in harmonization and cooperation in Customs administration and banking relationships. Finally, there is little doubt that regional cooperation in energy and infrastructure could yield dividends in terms of cross-border investments and joint ventures.